I Will Build My Church, by T. Austin Sparks : Val's Articles, Musings and Stuff! Reading: 1 Peter 2:1-12; Matthew 16:16-18. We turn to the Word of the Lord in Matthew 16:16-18; the fragment of that passage which is basic to our meditations is that in the eighteenth verse: “I will build my church,” and we will immediately seek to explain what we have in view. And it is, that which issues from the death and resurrection of Christ, and its real nature. It is here called by Him: “My church,” and that embraces matters no fewer and of no lesser importance than the Person of Christ, the death and resurrection of Christ, the heavenly position and activity of Christ, the advent and vocation of the Holy Spirit, the coming again of the Lord Jesus, the new birth, the warfare with Satan, and the vocation of believers in the ages to come. So that it will be seen at once that to be occupied with what the Lord Jesus calls “My church” is to be occupied with no small thing – not that it is my intention to deal with all these matters, but I simply want to have you impressed at the outset with the great importance of this matter. Our specific object at this time is the nature of what Christ effects and brings into being in His resurrection; and we shall consider this in two ways. Firstly, what we may call contemplatively or objectively, and secondly, introspectively or subjectively. That is, on the one hand we shall look at its nature as it is presented to us, and then on the other hand we shall look into it and see its deeper nature and content. To begin, then, with the contemplation of “My church.” We have read a passage which defines for us what Peter – the one to whom the statement was specifically made – understood it to mean: “…upon this rock I will build my church”; he did not understand it at the time. That is Peter’s explanation and definition: “…built up a spiritual house, to be a holy priesthood, to offer up spiritual sacrifices, acceptable to God through Jesus Christ. Because it is contained in scripture, “Behold I lay in Zion a chief corner stone, elect, precious: and he that believeth on him shall not be put to shame.” There you have what Peter understood to be the meaning of the Lord’s words in Matthew 16:16-18. When we turn to the letter to the Ephesians we have what the Apostle Paul came by the Holy Spirit to understand to be the meaning of such words. We shall leave that for a little while, returning to it later, bearing in mind as we go on, that what is before us is the nature, not just the object, but the nature of that which Christ brings into being in His resurrection. “I”; that carries with it two things quite clearly. One is that Christ builds the Church. That is discriminating and important. Christ builds the Church. No man can build the Church. Christ is the Builder. “And the Lord added to them day by day those that were being saved.” No man can add to the Church. No man can constitute the Church, no company of men, no committee of men. This is something which is the Lord’s doing, and if the Church is eternal, only the Lord can build it. What man may do will be but for a time. That is the faith with which the Lord Jesus faces the cross. It is a challenge. It is as though He were saying: “Let Elders, Scribes, Pharisees, Rulers, men and demons, and all the power of spiritual death do their work, and their utmost. I will build My church; I face the Scribes, Pharisees, Elders, Rulers, people, devil and death, and I will build My Church in spite of them all!” That “I” is a tremendous “I” as it comes there with the cross clearly in view, imminent. Now that leads us to three other things. 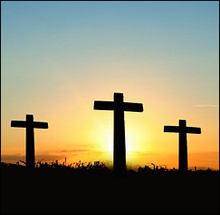 The cross and the resurrection mean, firstly, that the cross accomplishes something. You look at it this way and you will see what I mean. Here is the Lord Jesus standing with all that in view, and yet with an object which is the object for which He came, the object which has been in the Father’s heart, the Father’s thought and intention from eternity; the object which is the dominating object of His very Being: “My Church”; “I will build,” and yet before He can build that Church there must be this thing, this death, this cross, and this resurrection. It is not just some incident in His life, it is not just something which comes in the order and progress and programme of things; it is something which is basic to that object, without which that object cannot be, because this cross and this resurrection is to be the scene and the occasion of accomplishing something, apart from which accomplishment that Church cannot be. So that the cross and resurrection of the Lord Jesus accomplished something. They are a part of a scheme; a definitely arranged order of things in which they take a very vital and important place. I have to remind you that we are working towards seeing the nature of the thing that results from His resurrection, and therefore it is important to see that that character, that nature is resultant from His death and resurrection: that the death and resurrection, the cross of the Lord Jesus, gives character to the Church. And that is why they fulfil a purpose and are a part of the whole design, because that Church cannot be without them, inasmuch as it derives its very quality from them. You see the Lord Jesus, although He was set upon that object, could never have realised it by leaping over from Caesarea Philippi to the resurrection; that is, leaving the cross out. It was essential to His end because it had got to yield certain features which would constitute the Church. Those things we shall see later. Secondly, the resurrection of the Lord Jesus means a new ground by reason of a new state. Something has been left behind in the death. Some whole realm and order of things has been dismissed, put away, and entirely new ground is taken in the resurrection, and that new ground represents a new state, an entirely new state; and it is on that ground that the Church is built. The world is left behind. The world is ruled out, new ground is taken, and on that ground the Church is built. The Apostle Paul, writing to the Galatians explains the meaning of that so far as spiritual experience is concerned: “Far be it from me to glory, save in the cross of our Lord Jesus Christ, through which the world hath been crucified unto me, and I unto the world.” And when you and I testify to our union with the Lord Jesus in His death and burial and resurrection in the waters of baptism, we spiritually accept the position where the world is ruled out and left behind, and we take new ground; and that is the ground upon which the Church is built. In a word, the Church is built upon the ground where the world has no place. It is outside of the world. In saying that, we are, of course, saying something that is very familiar to most, but something which is growingly important in our time. The nature of that which comes out in the resurrection of the Lord Jesus is that it has left the world behind, and that it is outside of the world, in that sense in which the Lord Jesus used the words in His prayer: “They are not of the world, even as I am not of the world.” “…even as I…” You cannot now associate the Lord Jesus with this world; you cannot! And in exactly the same way you cannot associate His Church with it, and the church which is associated with it, is not His Church. Secondly, “…will build.” We have seen a little of the implications of that personal pronoun “I.” Now secondly, “…will build,” and for our present purpose we note two things. This means that the Risen Christ will be marked by purpose. “I will build…”; marked by purpose. I do not merely mean determination to do something; but characterised by a spirit, a power of purpose. I wonder if you have recognised that feature which comes spontaneously into the life of everyone who becomes vitally joined with the Risen Lord, that that life immediately assumes a spirit of purpose. If it never had a sense of purpose before, it has now. If it was a wandering, indefinite thing before, without object or aim or direction, the one thing that marks that life now is a sense of purpose, a sense of object, a definiteness of direction, a poise; and although as yet all that that means may not have broken upon the understanding, there is a sense that has come, and that sense has come out fo eternity, that life has come into the eternal, and by its union with Him has reached right back into the before times eternal, into the counsels of the Godhead, and has received now its character from those eternal counsels of the eternal purpose of God. As that life goes on with God it will move more and more to the place and state represented by the words of the Apostle Paul: “This one thing I do…” It is a sense of purpose. It is the purpose of the Risen Lord. And you know that when you come into the Ephesian letter that that is what you come into at once, “…quickened us together with Christ… and hath raised us up together, and made us sit together…” You are in the realm of the purposing of God concerning Christ, from eternity. “I will build My Church.” An atmosphere, a spirit, a sense of purpose. And, beloved friends, there is, I think, much room in many of the children of God, for that spirit, that sense, that dominating consciousness of purpose, so that they shall become absorbed, engrossed, dominated by one thing, the end which Christ has in view, and be burnt up with His objective, which leaves room for so much of the scattering, destructive weakening, paralysing work of the Devil. There is no greater defence against the Devil than for your whole being to be dominated by one object. We leave far too much room for him to come in by being like David, on his bed when the time came round that kings went out to battle. The Devil played havoc with David that night and David was weakened to the end of his days, and never recovered, because at that moment he was not taken up with the real business of life. The Lord would have us in union with Him in this sense, that we have this feature of His marking our lives clearly: “This one thing I do”; a sense of Divine purpose eating us up; the zeal of His House. “I will build My Church” is a statement which carries with it the spirit of One Who has one all-inclusive and governing object in view, and when you come to your later New Testament you find that that is the thing which marked apostles and believers. Read the Thessalonian letters again and you will see that that is the spirit of believers in general there. And read the letters of the Apostles themselves from the standpoint of the Apostles, and you find that their hearts are eaten up with this one object. Hear Paul: “…that we may present every man perfect in Christ Jesus.” That is something which has drawn out his whole being. Oh, that we should be one hundred percent on the Divine purpose, pouring ourselves into it without any reserve. That is union with the Risen Lord. That is to be the nature of the thing which comes up in His resurrection. It is something governed by one object – purpose and action, “I will build My Church.” We must remember that the Lord Jesus, from the day of His resurrection until now is in action. There is a sense in which He has sat down. That sense is that He has accomplished all the work necessary to secure the consummation of His Church. He is now at work by the Holy Spirit in the outworking of the accomplished work. He is still working. “He ever liveth to make intercession…” is one picture of Him in action. “I will build…” He is building, He is in action, and He would have all who are in union with Him, not only characterised by a sense of purpose, but definitely in action under that sense. It is just possible to have a sense of purpose, and it lies in tomorrow that never comes. When we are a little more qualified, when certain things have taken a certain shape, or transpired – there is always that will-o’-the-wisp future which we never reach, but when we will do what we purpose doing; but we are not doing it. The Lord Jesus not only has an object, but He is actively engaged upon His object, and we are the proof of that. Union with Him means that we are in action, definitely stretched out in action under a mastering purpose out from eternity; for the eternal element arises with the Risen Lord. Temporary elements have passed in His death. “I will build My Church…” Then we must be governed by a sense of purpose in this regime of the active Holy Spirit. Of course, the nature of the Church which He will build has been seen in Peter’s words: “A spiritual house.” It is a spiritual thing. “My Church.” There you have the implication of relationship and proprietorship. The Lord Jesus builds His Church, that which is peculiarly His in the sense that He has purchased it, He has made it His own by right of eternal choice, creation and redemption. It is His. It belongs to Him. And there again we have the importance of taking account of the fact that the sovereign rights in and over the Church belong to the Lord Jesus and are vested in no one else. It is not given to man or men to lord it over God’s heritage; to have the supreme government of the Church. It is His Church, and He is Lord of the Church, and the Church which He builds is that which represents the absolute Sovereign Headship of the Lord Jesus, to order, to govern, to direct, control, to have the first and the last word, and every word between. It is where Christ is Lord. That is simple; perhaps too simple and too familiar, but we are working on toward our object. “The house of death shall have no power of mastery.” That related to the Lord Jesus, and that relates to everyone in that union with Him as a part of His Church. He went into the house of death; the house of death closed upon Him. We must remember that death is always a thing of positive antagonism. There is a lot of romancing and sentimentalism about the friendliness of death. Death is always an Enemy in the Word of God and always stands in positive opposition to God’s intention, to God’s purpose. It is the opposite, and that actively so, of what God eternally intended, and at last death as the ultimate Enemy will be destroyed. It was necessary for the Lord Jesus to go into the house of death, representing all those who, because of the fall, have been enclosed in the house of death. In virtue of that, though the house of death may close upon you and me, if the Lord tarry, those gates of the house of death may close upon you and me, if the Lord tarry, those gates of the house of death shall not have power to prevent our being there in the perfected Church, in the consummated building of Christ. The house of death will have no power to retain you and me when that trump shall sound. He has the keys, that is, the authority, over the house of death, and death will not be able to frustrate the realisation of His intention, His purpose. The gates of Hades, the house of death, shall not prevail, shall not have power to prevent. That applied to the Lord Jesus, and that applies to the saints. And now to close, for the moment; the implication of this statement of the Lord Jesus reveals the oneness of Christ and His Church. “I will build My Church; and the gates of Hades shall not prevail against it” means, if it means anything, that the resurrection of the Lord Jesus is essential to the very life and being of the Church. To prevent Him from rising would be to prevent Her from having an existence. If Christ rises then it is unto the realisation of His Church, so that He and She are one by reason of one mighty victory over death. And that, I believe, is why, above all other things, there has been such a dead set through the ages against the testimony of the resurrection of the Lord Jesus. Why, immediately you come to the testimony of the Risen life of Christ you become the object and target of all hell’s assaults; and the one thing of which you become more acutely conscious than anything else is of the spirit and power of death, death working as a force against spirit, soul, mind, body. Why? Because the resurrection of the Lord Jesus is the greatest thing in the Bible, and upon the resurrection of the Lord Jesus everything in the Bible hangs. The purposes of God from eternity, before ever a page of the Bible was written, hung upon the resurrection of the Lord Jesus. It is the central and supreme thing in the history of the ages since man has fallen. And that testimony to have an expression in individual lives, and more, in a company, the Church, is therefore, the one supreme thing which rouses hell to its depths. Hell cares not about our systems of teaching, whether they are true or whether they are false; but hell does care about our living in the power of His resurrection. It does not matter to the Enemy how wonderfully accurate we may be in our Biblical interpretation, but the Enemy does, with all his might, withstand our Biblical expression in a life triumphant over death. It is for that that the Church has been brought into being. It is that which is the Church’s object here on the earth, to show forth Christ in Risen life and in Risen power. Very often the teaching can become the very thing which covers over and blankets and damps and numbs that life. You and I, beloved, have got to be very careful that we never become so interested in Christian doctrine and truth that it becomes the thing which occupies us pre-eminently. What you and I have to be occupied with more than anything else is the living of a life which is triumphant over death. That is a far more difficult thing than studying Christian doctrine; it is the battle of the ages. The nature of that which comes up with the Risen Lord is that it is a living expression of the fact that in Him to the full, and in Him initially and progressively, the gates of Hades, the house of death has not prevailed and cannot prevail.